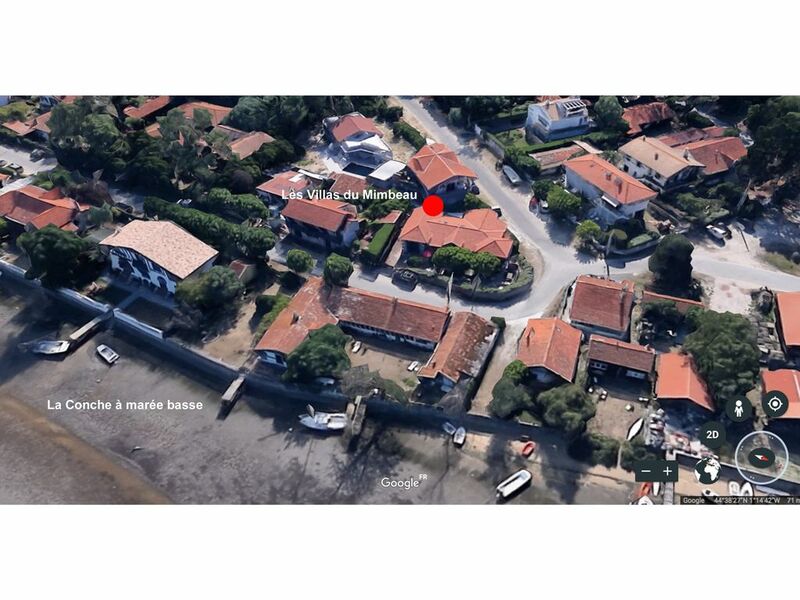 (Text automatically translated) Ideally located, great views of the Arcachon basin, Mimbeau and island birds, beach pool nearby, Ocean, 10 min walk, 5 min to downtown by bike (close to 44 hectares) quiet, comfortable, neat, 10m2 terrace, Recent construction in Cap-Ferret Similarly, in the heart of fishermen and lighthouse, in a classified site and protégé.Plus need a car, everything is by bike or decoration walk!! "great hosts, superb accomodation and fabulous views. will return!" "The owners, Marie and Denis are charming, gracious and perfect ambassadors for Cap Ferret! Their suggestions for buying fish, eating succulent oysters and exploration routes made our vacation perfect. Since I was running the marathon des villages, Denis devoted 2 hours of his time to accompany myself and husband to the race expo. His assistance in translating race instructions and showing me the race route was a wonderful gift. Our week's stay in the house was extremely comfortable, quiet and relaxing. Each day we discovered another perfect design detail that reflected Marie and Denis' effort to create a serene envirnoment. The sea views are wonderful with pink sunrises to delight the eyes. We will definitely return to this beautiful house, special village and our friends Marie and Deni. Sincerely, An American living in Holland"
"very friendly owner, excellent location, nice interior"
"Beautiful house, with amazing views and so much larger than the pictures show. Denis and his wife (the owners) are an absolute pleasure, and extremely generous and helpful!" Une semaine comme des princes ! Notre séjour à la Tchanquée a été un pur bonheur, la maison est idéalement placée face au bassin, l’espace intérieur est bien agencé, simple et avec goût. La lumière, la grande terrasse, de quoi se prélasser dedans/dehors. Mme Pasquale a été très arrangeante et disponible à nos questions. Nous reviendrons. Appartement très confortable, très bien équipé et idéalement situé, dans l'un des quartiers les plus recherchés du Cap-Ferret. Commerces à 15 minutes à pied et 5 minutes en vélo. Plages à proximité immédiate sur le bassin d'Arcachon (à quelques centaines de mètres). Plages océanes à environ 25 minutes à pied et moins de dix minutes en vélo. Accueil sympathique et professionnel de la part de la propriétaire, qui réside sur place. (Text automatically translated) Road TGV + Boats. Aeroport de Bordeaux. Request a map of the peninsula to the tourist office Lége Cap-Ferret. (Text automatically translated) 5 MINUTES BIKE. Restaurant by the sea: Chez Hortense, Pinnace coffee. Market Cap-Ferret every day. A 20 METERS of the house. Fisherman's hut, direct selling fish pond with fishermen! Oyster tasting on the terrace waterfront!! caution demandée, acompte/arrhes à la réservation, remise des clés par le propriétaire . Forfait ménage de 80/130 euros selon le nombre de personne. Linge de maison fourni (lit,bain,cuisine) en option pour 18 euros par personne. Taxe de séjour : 0,65€ par personne de moins de 18 ans.